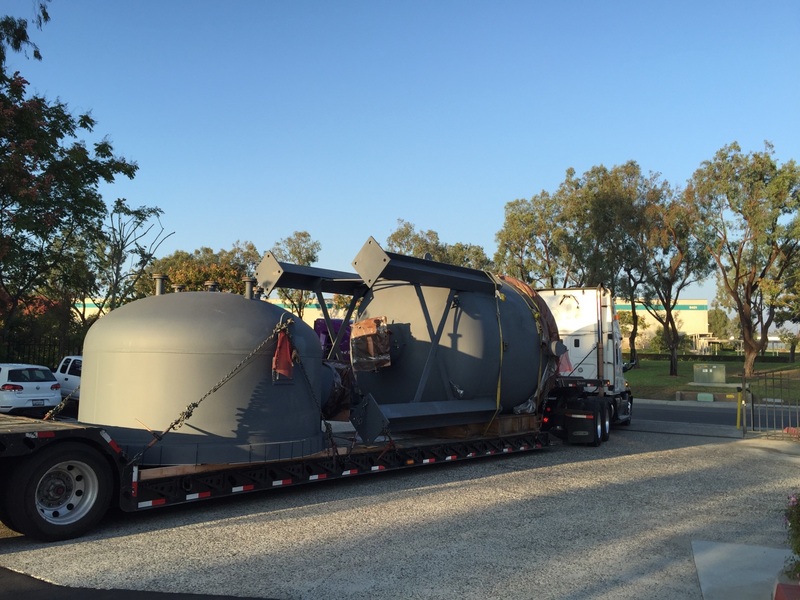 IRVINE, CA -- (Marketwired) -- 10/21/16 -- Ener-Core, Inc. (OTCQB: ENCR), a developer of innovative gas conversion technologies for global commercial and industrial facilities, has delivered two of its 2 megawatt (MW) sized Power Oxidizers to the Stockton Biorefinery site owned by Pacific Ethanol (NASDAQ: PEIX). The shipment is a momentous occasion for Ener-Core, having deployed a commercial scale-up of the power capacity of the Power Oxidizer technology from 250kW to 2 MW over the last 18 months. The Power Oxidizers, after delivery and installation with the Dresser-Rand KG2 turbine, are expected to provide up to 3.5 MW of electricity and over 26,000 pounds of steam/hr from the two Power Station units. The Power Stations will provide Pacific Ethanol (PEIX), a leading producer and marketer of low-carbon renewable fuels, with a first-of-its-kind solution that can reduce air pollution by converting by-product low-quality waste gases generated by the Stockton plant's ethanol production into useful electricity and steam. The Power Stations are intended to significantly reduce the quantity of energy currently purchased by Pacific Ethanol's Stockton plant and are expected to reduce their energy costs by an estimated $3 to $4 million per year, representing a significant reduction in operating expenses for the plant. The Ener-Core Power Oxidizer is designed to provide an alternative to a traditional combustion chamber within gas turbines for purposes of power generation. The Power Oxidizer, when coupled with an integrated gas turbine, allows a wide range of industries to utilize previously unusable low-quality gases and certain volatile organic compounds as a low-cost fuel source to generate on-site heat, power and steam. Ener-Core's delivery is the first step in the commissioning process and Ener-Core's engineering team will continue to work with the engineering teams from Dresser-Rand toward the installation of these systems at Pacific Ethanol's Stockton Biorefinery in next few months. Alain Castro, CEO of Ener-Core, commented: "The enthusiasm within our team runs quite high at the moment, as this is an important milestone for all of us, especially the engineers and staff in our Irvine, California headquarters that have worked so hard on the scale-up of this technology over the last two years. The road to achieving utility-grade scale of our Power Oxidizer represents a significant engineering accomplishment with global repercussions in a growing market segment. We, as a management team, are humbled by everyone's commitment to this common goal. We look forward to the installation of these systems at Pacific Ethanol's industrial plant later this year and to building upon this success and expanding our technology and product portfolio in the near future." Pacific Ethanol, Inc. (NASDAQ: PEIX) is the leading producer and marketer of low-carbon renewable fuels in the Western United States. With the addition of four Midwestern ethanol plants in July 2015, Pacific Ethanol more than doubled the scale of its operations, entered new markets, and expanded its mission to advance its position as an industry leader in the production and marketing of low carbon renewable fuels. Pacific Ethanol owns and operates eight ethanol production facilities, four in the Western states of California, Oregon and Idaho, and four in the Midwestern states of Illinois and Nebraska. The plants have a combined production capacity of 515 million gallons per year, produce over one million tons per year of ethanol co-products such as wet and dry distillers grains, wet and dry corn gluten feed, condensed distillers solubles, corn gluten meal, corn germ, corn oil, distillers yeast and CO2. Pacific Ethanol markets and distributes ethanol and co-products domestically and internationally. Pacific Ethanol's subsidiary, Kinergy Marketing LLC, markets all ethanol for Pacific Ethanol's plants as well as for third parties, with over 800 million gallons of ethanol marketed annually based on historical volumes. Pacific Ethanol's subsidiary, Pacific Ag. Products LLC, markets wet and dry distillers grains. For more information, please visit www.pacificethanol.com. Irvine, California-based Ener-Core, Inc. (OTCQB: ENCR) designs, manufactures and has commercially deployed unique systems that generate base load, clean power from polluting waste gases including methane. Ener-Core's patented Power Oxidizer turns one of the most potent pollution sources into a profitable, "always on" source of clean energy. Ener-Core's technology offers an alternative to the flaring (burning) of gaseous pollution while generating operating efficiencies and reducing the costs of compliance with environmental regulations. Ener-Core offers the 250kW Ener-Core EC250 and the larger, 2 MW Ener-Core Powerstation KG2-3GEF/PO. For more information, please visit www.ener-core.com.